The Functional and Reliability Testing took the Flight test aircraft, MSN065, across Europe and South America. The A350-1000 completed its exercise after landing in Toulouse, France on November 1st (07:00 UTC) coming from Barranquilla, Colombia. In less than two weeks the aircraft flew approximately 35,200 nm / 65,200 km representing 150 flight hours, as per certification requirements. These latest tests were part of an intensive Flight Test campaign which started less than one year ago designed to demonstrate readiness for airline operations. These included: high airfield performance, auto-landing trials, airport turnaround and handling services, cabin systems, navigation and connectivity function performance. The A350-1000 test flight was operated by Airbus flight test crews with the participation of Airworthiness Authority pilots from the European Aviation Safety Agency (EASA). 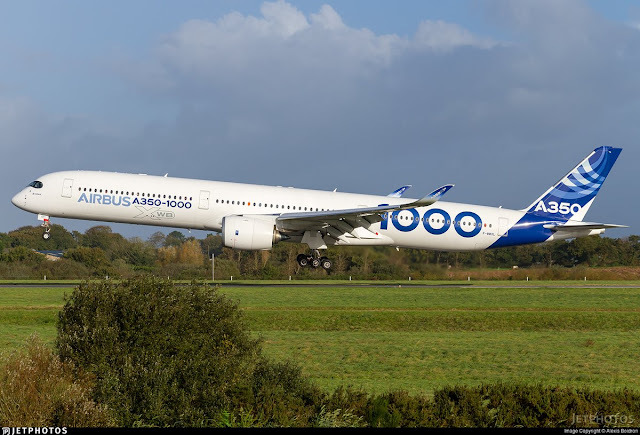 The A350-1000 is the latest member of Airbus’ leading widebody family, showing high level of commonality with the A350-900 with 95% common systems part numbers and Same Type Rating. Along with the A350-900, the A350-1000 is shaping the future of air travel by offering unprecedented levels of efficiency and unrivalled comfort in its ‘Airspace’ cabin. With its additional capacity the A350-1000 is perfectly tailored for some of the busiest long-haul routes.